Ken Crassweller was employed by the Department of Indian Affairs and Northern Development as Programme Development Officer, Arctic Division Office, and by the Northwest Territories government between 1962 and 1972. His task to evaluate the existing artistic and cultural situation of the North generated the papers in his collection. 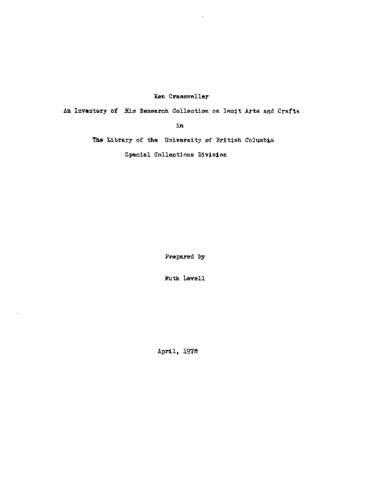 The fonds consists of records relating to Crassweller's involvement in the development of Inuit arts and crafts programmes. It has four components: the Project index, manuscript for Crassweller's Handbook of Eskimo Artifacts, working papers filed by subject and printed material. RBSC staff created an inventory for the fonds in 1978 (see attached PDF). This was appended with an initial accrual to the fonds in 2004. In 2019 a second accrual was made to the fonds, and a finding aid for this has been added as an addendum to the original finding aid, available as attached PDF.